The pipe organ in Mdina Cathedral was built in 1774 by the famous Neapolitan organbuilder Domenico Antonio Rossi. It is situated at the east side of the north transept. 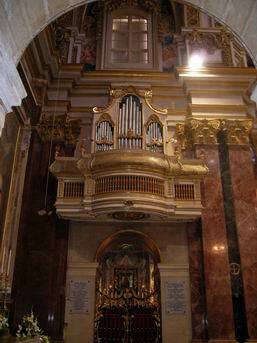 Rossi built several organs for Maltese churches but the Mdina Cathedral organ is his largest organ in Malta. It seems that Rossi was anxious to build an instrument worthy of a cathedral in certain respects. This is so when one considers the fact that the organ has some construction characteristics which are quite unusual to 18th century Neapolitan organbuilding and which became the norm only several decades later. The most interesting example is the �complete� lowest octave in the manual and pedal. This is a rare case in such organs since the usual practice was a �short� octave in the bass. Another interesting feature is the extention of the keyboard by 2 notes compared to the usual compass of similar instruments. Unfortunately the organ was modified substantially throughout its lifetime, especially in the first half of the 20th century. The original bellows, keyboard, pedalboard and stopknobs were replaced (and the original ones lost). The stop action was altered and some tonal changes were carried out which were neither skillfully executed nor successful. Moreover, the original fa�ade pipes, almost of pure tin, were extensively damaged by tin pest, a natural process. The restoration of this organ started in 2003. From the start it was clear that this important and unique Rossi organ was to be returned to its original physiognomy. This decision was taken also when considering the fact that the changes and modifications implemented earlier were neither skillfully carried out nor enhanced the organ�s functional and tonal qualities to justify their retention. To attain this aim research was carried out in Malta and Italy, and various Italian experts (experienced organ-restorers and a superintendence inspector) were consulted. Fortunately a researcher made a recent discovery in the Mdina Cathedral archives of the 1774 purchase contract between Rossi and the Cathedral Chapter. This document contained a detailed description of the organ which Rossi was to build and this was very useful to verify, determine and confirm certain aspects of the organ�s physiognomy. It has to be stated however, that in practice one should not blindly accept what is described in such contracts and hence all conclusions reached through this contract were confirmed by thorough investigation of the existing original material. (1)	Three wedge bellows and all wind trunking � the bellows before the restoration was a large quadruple-rise parallel bellows which was definitely not in style with the organ. Hence three wedge bellows were rebuilt in style with the organ, together with the required manual operating levers that allow the organ to be supplied with wind by manual operation. A very silent electric blower was introduced for normal use but the organ can still play without the need for the electric blower through the reconstructed manual pumping system. All wind trunking were reconstructed because the original had been discarded in previous repairs. (2)	Keyboard with ebony chromatics inlaid with boxwood and naturals covered in boxwood - The keyboard present before the restoration was a modern keyboard with plastic key coverings and therefore definitely not in style with the organ. Moreover its technical specifications were not coherent with the requirements of the organ. Hence a keyboard was reconstructed based on another Rossi keyboard. The choice of ebony with boxwood inlay for the chromatics and boxwood covering for the naturals was stated in the 1774 contract. The qualities of the new keyboard contribute to the re-discovery of the light and sensitive touch of such organs. (3)	�Slanting� pedalboard - The pedalboard present before the restoration was definitely not the original one and differed significantly in style from the typical pedalboards in Neapolitan organbuilding. It was also quite a low-quality artefact. Hence a pedalboard was built in the correct style and materials. (4)	Set of brass stopknobs copied from the only remaining original knob - The stop action had been significantly modified with no true advantage. Therefore the changes to the stop action were reversed. Only one original brass knob survived and hence 13 new knobs were built according to the original knob. (6)	New supports for the organ frame and new case panels (the existing ones were not original and heavily infested with woodworm). The existing frame and structural supports of the organ required to be strengthened by the introduction of new supports. This brought about the need for new case panels though the existing panels, heavily infested with woodworm, were not original. (7)	Two ranks of the Ripieno (the 22nd and the 29th) and some other missing pipes. The organ now has a total of 593 pipes of which 25 are new fa�ade pipes and another 135 were rebuilt as part of this restoration in replacement of non-original pipework which did not conform to original specifications. The organ was completely dismantled and transferred to Mr.Buhagiar�s workshop. Due to the very compact organ loft balcony it was very difficult to remove the biggest bass pipes the longest of which is more than 16 feet but eventually they were successfully transferred to ground floor. Since the top of these pipes is unreachable once they are assembled on-site these had to be voiced and accurately tuned in the workshop. Restoration at the workshop included the manual slider chest, the pedal windchests, pipes, and mechanical parts. After all parts were restored / reconstructed the organ was assembled again on-site. The next process was the setting of the pipes to obtain their original timbre. This process, called �voicing regulation� is a lengthy task which requires each and every pipe to develop its best original characteristics. Once all pipes were voiced they were tuned to a historically consistent �unequal� scheme, Tartini-Vallotti. Pedalboard constantly attached to the keyboard.